Banish is Nicola Marsh's début YA novel, a who-done-it mystery combined with Wiccan supernatural elements that kept me engaged and amused throughout. I liked the novel a lot, and although I think the story is perfect on its own, wouldn't mind a follow-up book or two!The YA aspect of the novel is handled very well, in my opinion, with the protagonist, Alyssa, painted as a mature, fiercely independent young woman who didn't have the best parental support growing up. Now living with her maternal aunt, she's trying to make a normal life for herself and get over the death of her ex-boyfriend. However, coming from a family that believes in Wicca and the supernatural, and not believing any of it herself, Alyssa's hard pressed to figure out who she is. It's this struggle for a sense of self that I found the most intriguing about her, and I identified with her in a lot of ways: she won't let anyone get in her way, and is infuriating and stubborn at times!I think the book is somewhat let down by the murder-mystery aspect - it's painfully obvious who the perpetrator is from about half way, after which we get treated to Alyssa turning a blind eye to the clues, until the climax where she's confronted with the facts. It wasn't particularly surprising, but I did find that the motivation of the 'enemy' to be very interesting, and it was cool to see the pieces slowly come together.My favourite aspect of the novel is definitely the romance - simply because the whole 'oh there's a cute guy' and 'omg he looked at me / touched me briefly' stages have firmly passed by the time the novel begins. Ronan and Alyssa clearly have feelings towards one another, and begin to explore them early on, which is awesome, because I'm sick of the formulaic way YA protagonists go about falling in love these days. And no love triangle (although I was, briefly, very afraid there would be one). Perhaps some readers will dislike the book because of the way the romance is handled, preferring to witness the butterflies in the tummy and rushing heat propagating out from where they touch, and all that, but I loved it!I really like YA novels inspired by Wicca and witches, but inevitably end up comparing them to my personal favourites, Cate Tiernan's Wicca (or Sweep in the US), series. I think Banish does an admirable job of living up to this standard, although I would have loved for the supernatural aspect to be explained more in-depth. 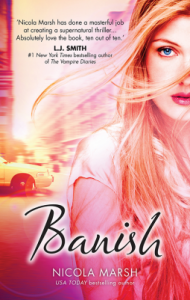 There are terms thrown around fairly carelessly and the implications of Alyssa's supernatural journey are left too open-ended for my liking.I recommend Banish to readers who are looking for a read that combines light-hearted humour with mystery and a hint of the supernatural. 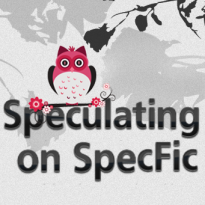 I really enjoyed it, and will be looking out for more of Nicola's books in the future.A copy of this book was provided by the publisher for review.You can read more of my reviews at Speculating on SpecFic.